save 1.99 on these free kindle mysteries! Detective James Dineen and his partner John Moreland hear a gunshot during a training exercise at the London Road police station. Running over, they find one of their colleagues is dead, with an unfired gun in his hand. It looks like a disguised murder, but with no witnesses and no motive the detectives must deploy all their skills to unpick the mystery. Soon there's another corpse, and a significant new clue. Their investigation takes them across Manchester as they go from shady pubs and opium dens to the Royal Exchange. A woman’s body is found floating face down in Heaton Park Boating Lake. Her throat has been cut, with flowers strewn around her. When an obvious suspect is found murdered in an even more grizzly fashion, the case becomes stranger still. Dineen and Moreland must find the killer, and the answer may just be found in a painting. Set in the Manchester of 1911, this detective story is an engaging tale of love gone wrong between rich and poor, the perils of prejudice, and a twisted murderer with a point to prove. Detective Dineen and his partner John Moreland investigate a break in at the Boddingtons Brewery, but it turns out that there’s a lot more going on, including criminals exploiting homeless boys. A life is at stake, and Dineen must come face-to-face again with his arch-enemy to solve the mystery. James Dineen is inspired by Sherlock Holmes, and tries unorthodox tactics that aren't taught in training school. He's from the same rough background as the criminals he pursues, so isn't afraid to bend the rules to solve a case. While John Moreland is a church-going family man, who plays by the book. 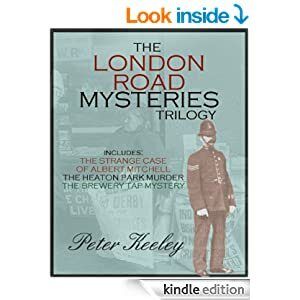 THE LONDON ROAD MYSTERIES will appeal to all fans of early 20th century detective fiction. Look out for further adventures on Amazon soon.